Everlast Blacktop is the leader in the driveway pavers industry due to our commitment to customer satisfaction, timely completion of projects and quality workmanship. We bring over 25 years of experience in driveway paving to the industry and employ only the highest qualified asphalt driveway experts to service Roselle and the surrounding areas. When your home or business is ready to upgrade to a new asphalt driveway or blacktop driveway, Everlast is the one to call. Your project will be met with excitement and completed to your satisfaction, we guarantee it! Only minutes from world-class shopping, arts, sporting venues and other entertainment, the village of Roselle is a western suburb of Chicago located in both DuPage and Cook County, Illinois. The nearly 23, 000 residents of Roselle enjoy the award-winning Lynfred Winery, a rich heritage and strong sense of community. Residents of Roselle know that the value of a strong community starts with choosing the right driveway pavers for the job, that’s why Everlast Blacktop is the one to call for all commercial and residential asphalt driveway paving and blacktop driveway needs. 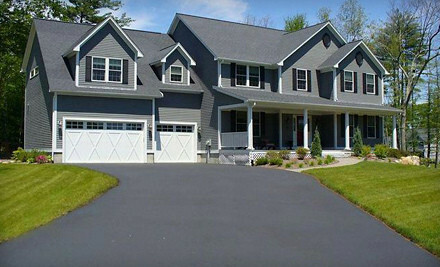 Is your residential asphalt driveway cracked? Does your commercial parking lot need driveway sealcoating? You can depend on the experts at Everlast Blacktop to deliver superior quality and long-lasting results for your driveway paving needs. Excellent customer service and affordable driveway paving for any size job is what you will get when you call Everlast Blacktop. Contact Everlast Blacktop today for a free quote or to get started on your blacktop driveway or driveway sealcoating repairs. Call (630) 855-7752 for great customer service and affordable driveway paving today!